If there is one company that never stops iterating on its product, then it's Google. 2018 has been a busy year for the search engine giant with the launch of cameo, the revamping of their entire marketing suite, the launch of voice schema support and so much more. Google latest announced is a new form of featured snippets aimed at showing you more useful aspects of a specific topic related to your search. Google has identified several search queries that normally follow one another as related questions and now collates these and provides this data to users in an accessible accordion within a SERP. So, when you search for a query that triggers this new format, you will get a handful of expandable snippets below the main featured snippet with more information. 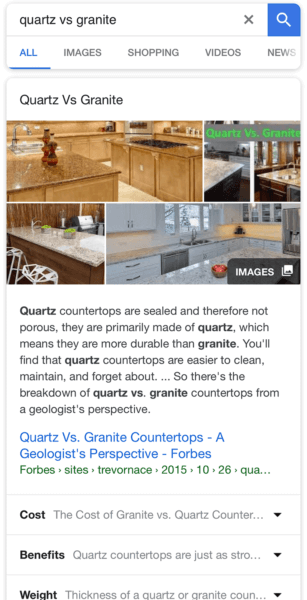 One example: If you search for [quartz vs granite] you get the main featured snippet, with images, and then four additional featured snippets that can be expanded to show you ideas on costs, benefits, weight and durability. Another example: When you search for [emergency fund], you get the main featured snippet, followed by size, importance, savings account and purpose. These new panels are automatically generated based on our understanding of these topics from content on the web, and we hope you find them useful as they roll out over the next few days. This update is the latest in a series of improvements we’ve been making to help you get information quickly with Search. As always, if you have any feedback on the information you see, please let us know via the feedback link at the bottom of the search results page. 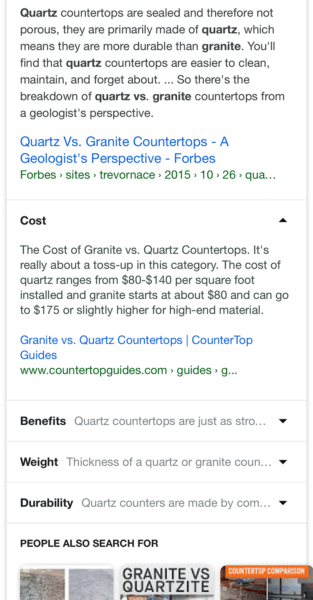 Back in February, Google announced multifaceted featured snippets; these are featured snippets that can be surfaced for queries that are sufficiently broad enough to allow for more than one interpretation of what was submitted. In these instances, the SERPs will include more than one featured snippet, with the original query rewritten as the questions the algorithm assumes the user may have intended or are most popular with other users. The results displayed in the multifaceted snippet will reflect those new questions. Why the need for these snippets? Google's most significant source of information is user inputs and behaviour and trying to remain as relevant as possible. Having these featured snippets eliminates the need for pogo sticking (bouncing from page to page) for information and gives users instant access to high-level information as they begin their research. They are then either satisfied with the answers or now have a better idea of what to search for to find the in-depth information they require. It also tries to discourage users from leaving SERPs as increasing the time and reliance on Google not only builds better brand awareness and affinity but allows them to increase the amount of ad real estate they can serve over time. Featured snippets may be helpful to users, but it can be harmful to content creators. In the past featured snippets were seen as highlighting an authority contributor and having the prized "Position 0" but it seems as if Google is slowly starting to marginalise the sources from which they retrieve this information and not crediting them with the additional value-add they used to get in the past. What I foresee is that more research-based queries will be answered by rich snippets and perhaps certain authority websites while this filters out more intent-based queries to find listings that are action based. For example, I could learn about marble vs granite tops, but if I'm ready to buy one, I will use a user intent query like buy, purchase, suppliers near me etc. Which means less unqualified or research traffic is hitting service provider pages and more intent-based traffic, providing top organic listings with more relevant visitors.